If you have a fretless guitar (not a bass) from Carvin/Kiesel, please post a picture. More people should be aware that Carvin/Kiesel offers fretless on guitars as an Option 50. Anyone considering a fretless guitar should have Carvin/Kiesel as one of their top choices, especially since the Hard as Nails fretboard finish works much better than an unfinished fingerboard. If this thread takes off, I may wind up having my plans for my next axe (non reverse Firebird III Studio w the three P90's and phase and tap switching) upended. I gave away a custom made fretless guitar years ago, in 1985, because I had just rec'd my Carvin 150 and couldn't put it down. Holy crap! I had no idea that they offered fretless guitars! Could you possibly record a demo of it? I'd love to hear how it sounds. I just bought and old(ish) Carvin fretless bass, and I've been considering a guitar for years, but all of the seemingly good ones are insanely expensive. I wonder if they do fretless without the fret lines. Johnland82 wrote: Holy crap! I had no idea that they offered fretless guitars! Could you possibly record a demo of it? I'd love to hear how it sounds. 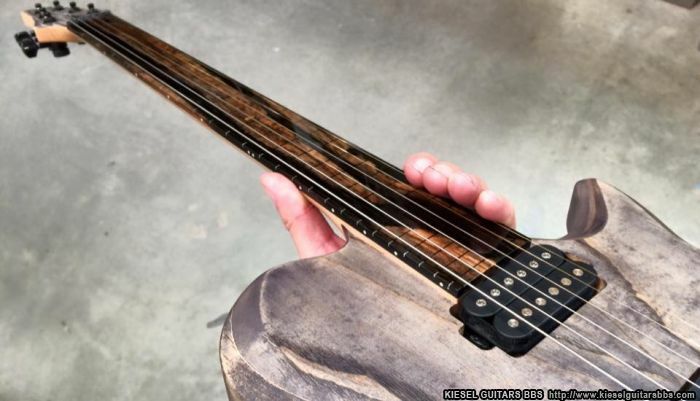 Yes, you can get fretless without the lines. Have you had a chance to try flats on it? How's the intonation coming? Any issues with wear? I'm still super excited by this guitar -- kudos to you for taking such a bold plunge! Koshchei wrote: Have you had a chance to try flats on it? How's the intonation coming? Any issues with wear? Haven't tried flats on it (and don't intend to). I use semi-flats (D'Addario EHR360) on my Warmoth fretless (Pau Ferro board), and plan to continue to use regular wound strings on Mystique. My intonation is improving, but still has a long way to go, especially when improvising (which is mostly what I do). There are a few light scratches in the Hard as Nails finish, but nothing that impacts playability. 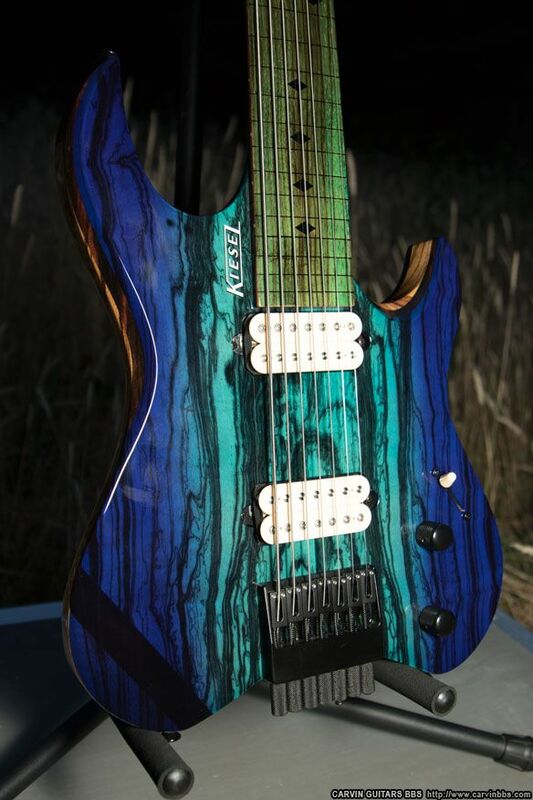 I'm loving that Mystique is featured as the header image on Kiesel Guitar's Twitter page and the Kiesel Edition page. Johnland82 wrote: I wonder if they do fretless without the fret lines. That, sir, is a "yes". Jeff posted this one recently. And just to be thorough, in case newer members never saw the glass fingerboard.. Remember that one? Well that is truly awesome. This is my first post here and you guys finally made a topic I couldn't shut up about. That is one obscure thing for option 50. Is there a list of all the option 50s? I know there was once a thread, but this seems like you could just make up anything for an opt 50. Anyway, I have finally gotten the 'hang' of fretless playing and now I can't believe Carvin would make them. They hate my pocketbook. That`s pretty much what an Opt50 is. Its ANYTHING you want done that they don`t have a pre-existing code for. It could be something simple like a color combination they don`t do standard, or something very complicated like a fretless multiscale with luminlay fret lines. The Opt50 is for basically anything they agree to do that isn`t a standard option. Not ALL opt 50 choices are non-returnable as well (although by their very nature it`s likely to be the case most often). I have a two part opt50 (trans black back and sides / trans black burst) and a opt51 (reversed silver drop shadow logo) on my current build. It is with a great sadness that I announce the death of my brother Greg Barnett, serious Kiesel enthusiast, collector, and excellent musician. Greg, who commissioned, among many other Kiesels, the 7 string fretless Vader "Mystique", died of complications from cancer on August 12th. If you are so inclined, feel free to play something seriously hard in his memory. Sailor Mike wrote: It is with a great sadness that I announce the death of my brother Greg Barnett, serious Kiesel enthusiast, collector, and excellent musician. Greg, who commissioned, among many other Kiesels, the 7 string fretless Vader "Mystique", died of complications from cancer on August 12th. If you are so inclined, feel free to play something seriously hard in his memory. That's terrible news. So sorry for your loss. I imagine mystique will live on for a long time in the Kiesel photo galleries. Ah, this is the thread I was talking about regarding fretless guitars and Greg.